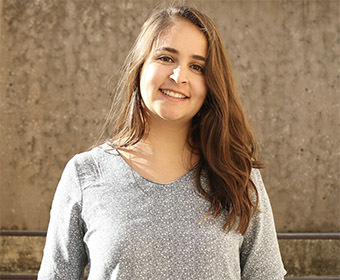 Drawing upon her Syrian roots, UTSA graduate student May Mzayek conducted research to help others understand the challenges faced by refugees. (Dec. 13, 2017) -- Meet May Mzayek. She’s using her studies at UTSA to take on the refugee crisis. Born in Aleppo, Syria, Mzayek immigrated to the United States with her parents and sister in 2000, when she was just 10 years old. Mzayek’s father was motivated to move his daughters to U.S. so they could have as many opportunities as possible. Mzayek’s father, previously a medical doctor in Syria, worked to obtain his Ph.D. in public health, instilling a deeper respect for higher education in his children. Then, just one year after their arrival in the U.S., terrorists attacked the nation on September 11. In the wake of the tragedy, Mzayek began to experience Islamophobia. Mzayek was inspired by how hard her parents worked to bring the family to the U.S., and believes that gave her the conviction to change the world’s perspectives on Arabs and Muslims like herself. After completing her undergraduate studies in Tennessee, Mzayek set her sights on the master’s program in archaeology at UTSA. Shortly after Mzayek arrived at UTSA in 2014, the Syrian Civil War, which has been ongoing since 2011, began to escalate. She found herself struggling to focus, with her thoughts constantly straying to her family back home in Syria, many of whom became refugees as a result of the intensifying conflict. As a result of those challenges, Mzayek was drawn to a new academic project that gave her a stronger sense of purpose. She switched the focus of her studies to cultural anthropology so that she could work with Syrian refugees in the U.S.
Mzayek worked with the Syrian American Refugee Aid Organization in Austin, which aids Syrian refugees, to study the well-being of refugees in Austin. As Mzayek prepares to graduate with her master’s degree, she’s now working on completing a study on the well-being of Syrian refugees in the U.S., and hopes to publish it soon. She’s also reminding herself to keep in touch with the UTSA family that supported her through such a difficult time. Mzayek has plans to eventually pursue a Ph.D., but for now is interested in working with a non-profit, possibly in the Middle East, so she can continue to work with refugees. Learn more about the UTSA College of Liberal and Fine Arts and its Department of Anthropology. Learn more about the UTSA master’s degree in anthropology. Meet other Fall 2017 graduates.